ACVC 2018: Crush the Cush! What's New With Hyperadrenocorticism? Current options for diagnosing, treating, and monitoring Cushing disease. 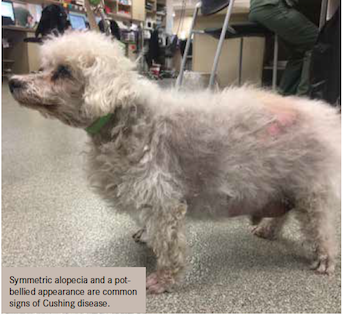 Hyperadrenocorticism (HAC)—or Cushing disease—is among the most common endocrinopathies in dogs. With no single gold-standard diagnostic test available, diagnosing canine HAC can be complicated. Treatment decisions are also not straightforward, including determining which treatment option is right for your patient, and even deciding whether to treat at all. Approaching testing and treatment from the right perspective can save you headaches and confusion in the short term, and increase your chances of therapeutic success in the long run. During his Tuesday morning session at the 2018 Atlantic Coast Veterinary Conference®, Peter S. Chapman, BVetMed, DECVIM-CA, DACVIM, MRCVS, who practices at a large, multispecialty hospital in the Philadelphia, Pennsylvania, area, walked attendees through a rational approach for diagnosing and managing this relatively common disease. HAC is one of the most challenging endocrinopathies seen in dogs, he said, but with the right testing protocol and treatment options in place, these patients can live longer, happier, and healthier lives. The most commonly used screening tests for HAC are the urine cortisol-to-creatinine ratio, the ACTH (adrenocorticotropic hormone) stimulation test, and the low-dose dexamethasone suppression (LDDS) test. The urine cortisol-to-creatinine ratio is a useful test because it’s noninvasive, relatively inexpensive, doesn’t require hospitalization, and has high sensitivity. Although false-positive results can occur, a negative result (ie, a normal ratio) rules out HAC in 97% of cases. Dr. Chapman cautioned, however, that the cortisol-to-creatinine ratio can never be used alone to diagnose HAC. Most veterinarians turn to ACTH stimulation tests or LDDS tests to verify a suspected case of HAC. The ACTH stimulation and LDDS tests both have advantages and disadvantages, Dr. Chapman said. The ACTH stimulation test has a sensitivity of approximately 65%, likely will not identify adrenal tumor–based HAC, and can yield false-positive results when concurrent illness, such as diabetes, is present. The cost of performing the ACTH stimulation test can present further challenges, although cost-cutting strategies (eg, using a lower cosyntropin dose of 5 mcg/kg, freezing aliquots of cosyntropin to extend the shelf life to 6 months) can offset some of these issues. “In general, the test cannot be recommended as a first-line test for diagnosis of HAC,” Dr. Chapman said, but it still has applications for initial diagnosis and for monitoring dogs being. In contrast, the LDDS test is 95% sensitive, has good specificity, is less expensive to perform (compared with the ACTH stimulation test), and can identify dogs with adrenal tumors. But Dr. Chapman cautioned that the effects of short-term stress should be taken into consideration when performing this test. “Basically, any kind of stress can potentially cause an adrenal response and increased production of corticosteroids” Dr. Chapman said. So, the acute stress associated with hospitalization and drawing blood can affect the pet’s cortisol levels for the LDDS test, but will not alter the results of ACTH stimulation. Patients should be kept as quiet as possible to help reduce the effects of acute stress on LDDS test results. Traditionally, the high-dose dexamethasone suppression (HDDS) test has been used to differentiate pituitary-dependent HAC from adrenal tumor. But Dr. Chapman rarely performs this test and instead prefers abdominal ultrasound for this purpose. “In pituitary-dependent HAC, both adrenals are expected to be normal or enlarged. In patients with an adrenal tumor, a mass or nodule may be identified, and the contralateral adrenal should be small,” he said. Most dogs with HAC, Dr. Chapman said, are otherwise healthy. After testing the patient, the veterinarian needs to decide whether the benefits of treatment justify the risks for the patient and the expense for the owner. “The decision to treat should always be made based on the impact of the clinical signs on the quality of life of dog and owner,” he advised. Surgical options (eg, adrenalectomy for adrenal tumors) are available, but Dr. Chapman noted that dogs with HAC usually have a high risk of complications when undergoing surgery and that it’s extremely important to make an accurate diagnosis prior to treatment. Medical treatment is, by far, the most common approach to controlling HAC. Dr. Chapman discussed the two drug options, trilostane and mitotane, noting some of their risks and benefits. Trilostane is a reversible inhibitor of cortisol production given at a twice-daily dose of 1 to 2 mg/kg; it is less effective when given once daily, he said, because of its 6- to 12-hour duration of effect. Mitotane, which is cytotoxic to adrenal cortex cells but spares zona glomerulosa cells responsible for mineralocorticoid production, is initiated at a daily dose of 50 mg/kg and then maintained at a weekly dose of 50 mg/kg. It may be a good option for dogs that don’t respond to trilostane. The primary complications associated with these drugs are hypocortisolemia (trilostane) and hypoadrenocorticism (mitotane). “No clear benefit of one medication over the other has been demonstrated for dogs with pituitary-dependent HAC,” Dr. Chapman said. He explained that prolonged median survival times (>2 years) have been reported with both medications, with most patients succumbing to problems other than the primary disease.